This typically Sicilian sauce for spaghetti has taken its name after the person who first made it. Sicily is very much like Greece. The Island of Sicily is now part of Italy countrywise but the rest of Italy still considers Sicily as part of Africa. During The Greek Period (8th Century B.C.) Sicily belonged to Greece. It is therefore not strange that the culture and cuisine of Sicily much resembles that of south Greece. 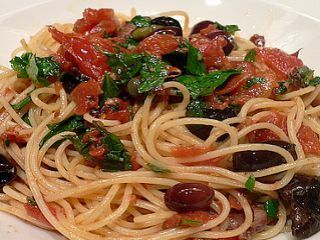 The use of black olives, oregano, tomato sauce, chili pepper is very common in both cuisines. - 500 gms of spaghetti boiled as per instructions on package. - 500 gms of grated tomatoes. - 10 - 15 pitted whole black olives. - Freshly grated parmezan cheese. - Fresh Oregano and Basil leaves. - Cook spaghetti as per instructions on the pachage and my "How To" section of this blog (coming soon). - In a deep sauce pan, heat some oil, add the grated tomato, the black olives the chili and some salt and let simmer for 10 minutes. - In a special pasta bowl add the steaming spaghetti, pour the sauce, sprinkle with grated cheese and top with oregano and basil leaves.